The first story begins at a time where Galactus recruited Dazzler (who had gained a massive power boost after a battle with Klaw the master of sound) to retrieve his rogue herald Terrax, who was hiding in a black hole. In this story, Galactus decided to punish Terrax by sending him back to the black hole for eternity, separating him from his ax so he can't escape. Galactus declares Dazzler will be his new herald, stating that he will spare the Earth from any hunger if he does. Dazzler reluctantly accepts, and Galactus imbues her with the Power Cosmic. Dazzler continues her duties for centuries, kept eternally young thanks to the Power Cosmic. One day, she calls Galactus to a planet thinking there is only plant life on it, only to discover that the plants are peaceful sentients. However, when Galactus reaches it, his drone R-11 suddenly reads different readings from before, now saying this planet isn't acceptable to eat. Dazzler realizes that Galactus must have changed the readings himself, and must have decided that Dazzler's attempts to keep him from eating sentient life is a good thing. Dazzler is attacked by an armada of survivors of planets Galactus has destroyed. They ignore her protests that Galactus has changed, and attack her with a weapon made from the recovered ax of Terrax, seriously wounding her. Galactus easily tanks their ultimate weapon, destroying them all along with the ax of Terrax. Dazzler in her unconscious state manages to heal herself with the Power Cosmic. 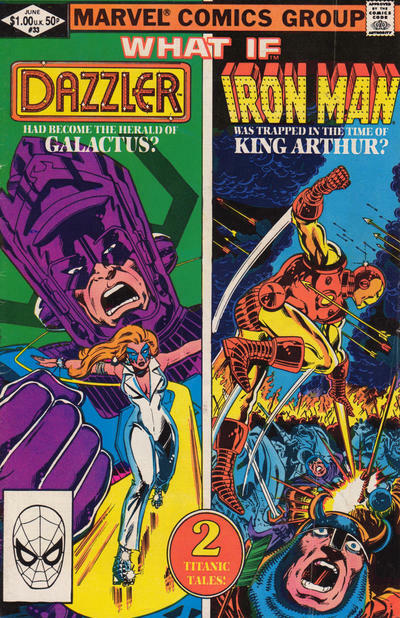 The second story starts with Iron Man and Doctor Doom trapped in the time of King Arthur. Doctor Doom makes the offer to unite their efforts to return to their own time by cannibalizing parts of their respective armors. Iron Man asks how he can trust a man who swore to kill him. While in 616 Doom gave him his word, here he just points out he doesn't have a choice. This means that he betrays Tony last minute and leaves him stranded. While Tony has already made allies with Arthur and Camelot, he lacks the resources to fully restore his armor, let alone build a time machine. He almost falls back into alcoholism but manages to resist, and even his weakened armor allows him to easily fend off Morgan Le Fay's barbarian invaders. In recognition of his efforts, Arthur knights him and inducts him into the Round Table. During the battle, Mordred manages to wound Tony with a dagger made from a piece of Excalibur, disabling his armor. With Camelot under siege, Tony manages to jury-rig alchemical supplies into crude machines, and over the course of two weeks by working without rest manages to repair his armor enough to help fend off the invaders.
" .. darn it. " One of the most famous sonets of that time is the immortal song "Doom is a poopyhead that stinks of poop" reportedly commisioned by King Anthony himself. Scholars have debated for centuries the meaning of this song to no avail. So these are some of the rare what-ifs that had better results than 616? I don't know if they're better, but at least they're hopeful. Unless you were living on Earth in the first one, or were born after the thousand years of peace of the second one. Climate change rendered Earth inhospitable perhaps? Galactus has some really large piercing blue eyes. Doesn't Iron Man's armor need recharging? This is a rebuilt suit that uses local fuel sources. Holy wow, I actually owned this book, like bought it off the rack owned it, way back in the day. Iron Man used to die a lot in these old What If stories. This tima, he's a king, but still, removed from 616 present time. Somebody up there didn't like him much.